These are the stone like solid material formed in kidney from the substances of Urine. 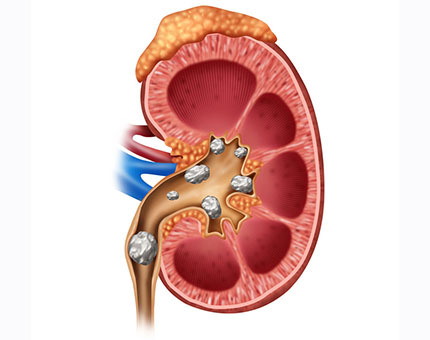 Family history, sedentary lifestyle, repeated urinary infections and mental stress are the common causes of Kidney stones. Kidney stones may be passed without any symptoms.It produces symptoms when it gets obstructed in the track. Pain in the back (loin) and sometimes it may radiate to the lower abdomen, nausea and vomiting, fever and chills, difficulty in urination, bloody urine are the common symptoms. Homoeopathy has wonderful medicines which help in the passage of stones. Ayurvedic herbs like Pashanabheda,Shunti,Varuna,Shigru, Kooshmanda helps to flush out stones. Naturopathic diet helps to lead a healthy life and helps to avoid reoccurrence. In Priyam clinic, Our Homoeopath selects the best remedy for your acute state and also selects the medicine for a complete cure after a complete case taking. Ayurvedic and Naturopathy practitioner plan the best method for a healthy life. For acute condition, usually patient responds in 6hrs -1 day. 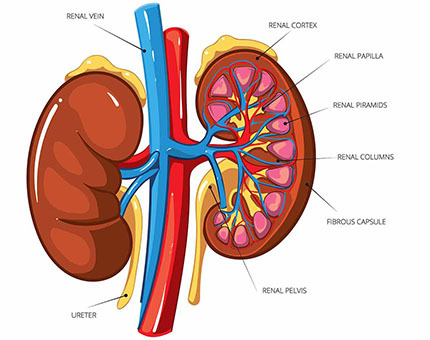 Kidney acts as a purifier of blood. It filters the waste products of blood and also secrets hormones which help to normalise the Blood pressure and production of Red blood cells. So in Kidney failure, waste product stagnation in the blood leads to swelling, decreased urine output, weight loss, tiredness. It may be acute (sudden onset)or chronic(slow onset). Drugs which are injurious to the kidney, Cancer of abdominal organs, loss of appetite, burns, injury causes acute kidney failure. Poorly controlled Diabetes and hypertension, Polycystic kidney disease are the high-risk factors for Chronic Renal Failure. In our priyam clinic, We have a successful protocol to treat Renal failure.Our Homoeopathic consultant selects the best remedy after taking a complete history. Along with Homoeopathic remedy, Ayurvedic diet plan and herbs like Punarnava, Kaasni, Varun, Gokshur, Palaash etc selected on the basis of patient’s health. Our Specialised Kidney detox treatment along with medicines gives a good result. AVOID DIALYSIS!! LET'S HEAL OUR SYSTEM NATURALLY!! Urinary system does excretion through its organs. Kidneys, Ureter, Bladder and Urethra are the parts of a Urinary system. 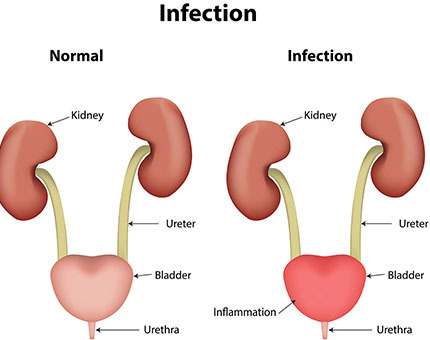 Infection at any site in Urinary tract is called as UTI. It occurs due to Infection of Microorganisms. Fever, chills, pain/ burning urination, lower abdominal pain, change in color and smell of urine, frequent urgency to pass urine are the common symptoms. Homoeopathy medicines based on the nature of symptoms helps to cure the infection rapidly. Ayurvedha herbs like Brihatyadi Kashayam, Guluchyadi Kashayam, Ushirasava, Chandanasava, Sarivadyasava, Shatavari, Anantamool, Dashamoola helps to cure UTI rapidly. Naturopathic diet and lifestyle modification advise given to avoid further recurrence. Unable to control the passage of urine is called as Urinary Incontinence. 1. Stress incontinence - occurs during a cough, playing, laughing and sneezing. 3.Overflow incontinence - Dribbling of urination after the bladder is full. Brain or nerve problems,muscle control problem, dementia, Brain problem, Dementia, weakness of pelvic muscle, prostate enlargement are the common causes. Full case history and investigation helps to find out the cause. 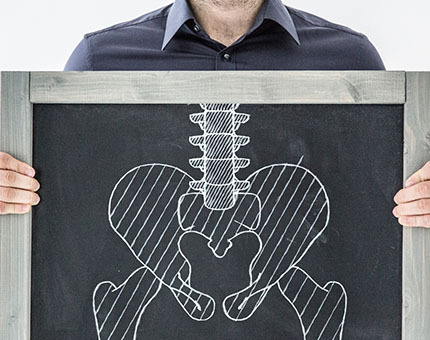 In our Priyam clinic, our doctors diagnosed the exact cause for the incontinence and treatment is planned depending upon the nature of a disease. Its a scar like formation in urethra leads to narrowing of the urethral lumen. Scar formation occurs due to injury caused by Instrumentation or repeated Infection. It causes pain during urination, dribbling urine flow and difficulty in passing urination. Homoeopathic medicines help to scar dissolution effectively. Ayurvedic procedure Uttarbasti helps effectively in managing Stricture. In our priyam clinic, Our Homoeopathic consultant selects the best remedy based on the nature of a person which can cure the strictures. Ayurvedic herbs and panchakarma help in fast recovery.